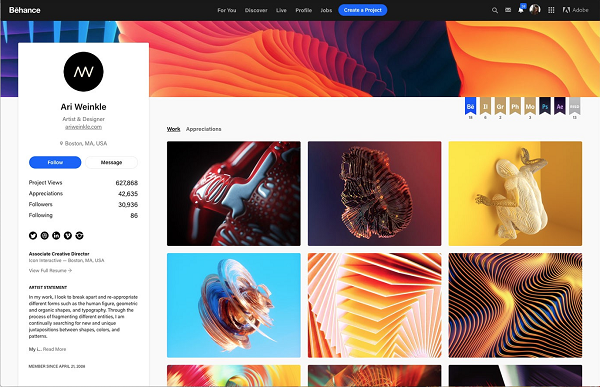 Creative platform Behance has unveiled new profile and project pages to better suit the modern audience. The new page is said to better display creatives’ works and it definitely doesn’t disappoint. The updated page allows designers to present larger, single projects in all their glory with less limitations. The text that once sat below images to display the creator’s name, views, and ‘like’ count has been removed. If the viewer wishes to learn about these details, he or she can simply hover their mouse over the project image. The new redesign also lets creatives upload a custom design banner to their portfolio. This feature isn’t mandatory, but it enables a designer to add personality to his or her brand just by dragging and dropping an image of their choice. To learn more about adding Behance profile banners, click here. The revamped profile also sees a better layout of individual project pages, thereby enabling viewers to better appreciate these creations. Designers can fill large hero images on the screen and present the necessary information at the top and bottom of the page. Actions such as share, save, follow, and appreciate are now available too. The new look has rolled out on the Behance website.